PsychologySalon: "Original Practices" for Shakespeare: Faithfulness or Fundamentalism? "Original Practices" for Shakespeare: Faithfulness or Fundamentalism? The Festival Theatre's thrust stage. Last week I was teaching about group therapy in Kingston Ontario, and decided to stay on and drive to Stratford, close to where I went to graduate school in the last millenium. The festival at Stratford was a welcome diversion from psychology research so I would attend regularly, and since moving to Vancouver I’ve often taken the opportunity to stop in while visiting Ontario in the summer. Monday night I attended the Festival’s opening of Romeo and Juliet (Shakespeare’s cautionary tale about teenage impulsivity). It was helmed by British director Tim Carroll, who has a long association with London’s Globe Theatre, an open-air recreation of the theatre that Shakespeare’s company originally played in. Like most companies presenting Shakespeare, Stratford often shifts the circumstances of the play somewhat. Sometimes it’s World War I, sometimes the future, sometimes the gender of one or more characters is switched. The current version of Romeo and Juliet is done in “Original Practices,”(OP) meaning naturalistic lighting, no amplified music, no sound assist, and very little directorial blocking (telling the actors where to stand and when). This is the way the plays were done by Shakespeare himself, largely out of necessity. There was no electrical light, no audio technology, and, apparently, there was often no director of the play in the modern sense. So how does this work in the enclosed Festival Theatre at Stratford? After all, without artificial light no one would see anything at all. The sense of an afternoon performance is given by having most of the house lights on, so the audience is plainly visible, and no use of lighting effects for shifting the mood or audience’s attention. The increased presence of the audience allows the actors to address the crowd directly. Shakespearean soliloquies are directed straight at the audience rather than looking like spontaneous inner dialogue. Bit players can kibbitz with those in the front row. In the case of Stratford’s R&J, the Nurse angrily heaves bread loaves at a retreating character, landing many of them in the seats. An illiterate Peter, given an invitation list, helplessly hands it to someone in the front row for assistance. A few comic bits work well this way. The answer, it seems to me, is that the audiences themselves were different people. They lived in a world of drudgery, plague, and strife. Never having known amplified music, complicated lighting effects, or stagecraft, they didn’t expect it. The experience of seeing a group of people putting on a play would have been profound. In 1933, the original version of King Kong frightened, amazed, and thrilled audiences. The special effects were astonishing. Today, it’s still possible to watch the film and appreciate it, and you can find yourself wondering “How on earth did they manage that in the 1930s?” But it’s a different experience, and tends not to grab you by the throat the way it did its original audiences. In elementary school I saw my first stage production – a musical put on by the high school down the road. To my eyes, the illusion was complete. An altogether different universe appeared on stage in front of me, and infinitely old, mature, and accomplished professionals seemed to vanish altogether in their roles. It would be nice to see a film of that production – I suspect that although I could appreciate their efforts, it would have a much-diluted effect on me now. What I’m suggesting is that theatre is interesting not because of what appears on stage, but because of a relationship between the production and the minds of the audience. The effect of a play depends on both the mechanics of the play and the characteristics and history of the audience. It’s possible to reconstruct the former but not the latter, and as a result the relationship is completely different. For example, imagine seeing an “original practices” version of a Sophocles play – declaimed in ancient Greek. This would be a profoundly interesting experience if done well – but it couldn’t possibly produce the same effect on a modern audience as an ancient one. Not because the modern audience cannot feel the same things, but because the stimuli that elicit those feelings have shifted. As a result it seems inevitable, at least to me, that OP productions will tend to reproduce the form but not the impact of the plays. Certainly that seemed to be the case Monday night. The audience response was remarkably lukewarm for a season-opener and people scattered into the night quickly. The reviews have been unenthusiastic, to put it mildly. (A particularly brutal and mean-spirited review by Richard Ouzounian in the Toronto Star seems to be an example of wounded childish rage rather than sober judgement.) One reviewer talked of staying awake by counting his fingers. The proponents of OP seem to feel that they are being loyal to Shakespeare, eschewing the bells and whistles that really can just distract from the plays themselves. But what would Shakespeare himself have done? It seems inconceivable that he would go for the difficult conditions under which he had to labour. Or that he would see his own Globe Theatre as being, coincidentally, the pinnacle of theatrical presentation. My guess is that he would seize upon modern technology and exploit it mercilessly to sharpen (not distract from) the presentation of his plays. And he would look upon the OP purists as having missed the point. 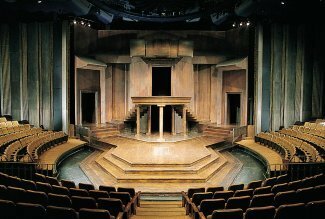 The Stratford Festival is one of North America's greatest theatrical experiences, and richly deserves an audience. I saw four plays while I was there and three of them (the other three) were terrific. Blithe Spirit shows a classic Noel Coward at his witty, brittle, and somewhat brutal best. Mary Stuart portrays a fictional meeting between Elizabeth and Mary Queen of Scots before the latter's execution, a complex dance of motivations and political intrigue that avoids pointing fingers at obvious villains - this may be the hit of their season. And The Who's Tommy (which I attended because it fit the schedule, not because I was drawn to it) is a big, expensive production that completely engaged the audience and seems clearly designed to travel elsewhere when it is done at Stratford. Plus, the town of Stratford itself is beautiful and well worth a visit. I work with an "Original Practices" company in Maryland and your blog post was passed along to me by another company member that found it on the internet. I've worked on Shakespeare almost my entire professional theater career and done it every way imaginable. I've also seen Shakespeare done terribly in every way imaginable (and taken part in a few of those productions). I submit to you that you might have just seen a bad show. Believe me, it happens. I offer to you this defense of OP. In Elizabethan England, audiences went to "hear" a show. Nowadays we go to "see" them. OP offers actors, directors and designers the chance to replicate (we think!) some of the practices of Shakespeare's company, not as simply a historical exercise, but as (hopefully) a chance to see if the plays open up even further to us. Honestly, I've seen it work beautifully. I've had audience members say to me they've never understood the plays better than when all the extraneous stuff was stripped away and the actors let the words speak for themselves. Actors often wonder why Shakespeare takes 10 or 20 lines to describe the forest, or the castle, or the battle. Just get to the action! He takes that time because he had to paint the mental picture for the audience. These days, money has been spent to build the forest,or castle; or 20 extras are paid to play dead soldiers. Those beautiful descriptions become unnecessary. I think if we asked Shakespeare how to perform his play today he'd say, "Speak my words beautifully, and don't let the clown go on too long." I wrote this long comment only to say: I hope you'll give another original practice performance a chance. I can't speak to this particular production of R&J, having not seen it, but don't let it talk you out of OP forever. I suspect I might well enjoy an OP performance at the Globe in London or a place that is purpose-built for this type of production. Using the Festival Theatre for it, though, felt quite artificial. It takes their incredibly sophisticated lighting system and preplanned "random fluctuations" to simulate an outdoor performance, which felt glaringly artificial. It created, as one critic commented, a Brecht-like alienation effect that pulled me (and apparently most of the critics and audience) out of the play, the plot, and the text. Judging from the empty seats after the interval, it also pulled some of the audience completely out of the theatre. Some folks in a related stream on reddit have argued in favour of the purity of OP over the artificial tarting-up of Shakespeare by setting it in spaceships, the back seat of cars, in mid-air, in Miami, and so on - anything to provide a song-and-dance that distracts people from the fact they are watching (and hearing) Shakespeare. (Like stuffing dog medicine inside a piece of cheese.) I agree that many productions seem to have little faith in the actual plays and have caught myself rolling my eyes at the contortions people go through to make the plays "relevant." But I do think there is an absurd quality to the use of modern technology to pretend that there is no modern technology. And I do wonder how Shakespeare would stage his own work if he were brought into the modern age. I suspect he might put on an OP production now and then "for old times' sake," but that he would also embrace the technology to facilitate a more direct (not distracting) presentation of his text. By this I don't mean crashing chandeliers, landing helicopters, or web-slinging aerial fights, obviously.